Find hotel near Cardiff Executive Apartme .. Located at a convenient distance from the popular attractions, the Cardiff Executive Apartments offer sophisticated accommodations for both corporate meetings as well as family vacations. 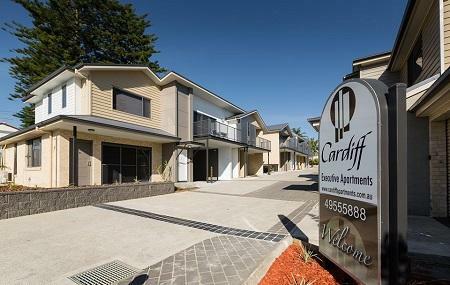 Cardiff Executive Apartments are air-conditioned and smoke-free and offer all the necessary and luxurious amenities such as free private parking, shuttle service, laundry service, family rooms, babysitting and nursery facilities. There are Two Bedroom Apartments, One Bedroom Apartments and One Bedroom Apartment with Spa Bath and open Patio. Enjoy your stay here and explore the nearby attractions such as Westfield Kotara, Cameron Park Raceway, Babbingtons Bar & Grill and Bay Of India. Great facilities and really large apartments - had everything we needed for a weekend stay. Nice amenities. However, the apartment was very dirty. Nice place to stay but not very well looked after. Very clean appartment with all required kitchen utensils etc provided. Suited our family well. Good air conditioning in 1 bedroom and lounge room. Only 600m walk to Woolworths/BWS.